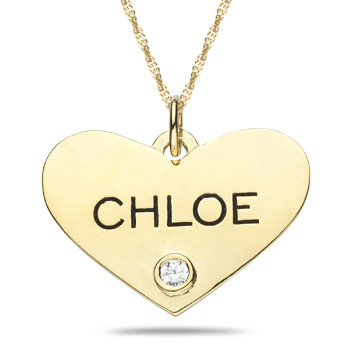 Personalize this beautiful heart pendant with any name or engraving of your choice. Choose from a white CZ stone or genuine diamond. Also available with gemstone options. Your choice of 10k or 14k yellow or white gold. Pendant measures just under 1" wide (23mm) x just under 3/4" tall (18mm). 14k gold 18" singapore chain included. May engrave up to 8 characters (font size will adjust to fit across pendant surface). We guarantee our Engraveable Heart Pendant with Stone to be high quality, authentic jewelry, as described above.